Movie stars behave badly and look great doing it in Gary Ross' Ocean's 8, a spinoff of Steven Soderbergh's Ocean's Eleven trilogy, which was itself a remake of Lewis Milestone's 1960 original starring Frank Sinatra, Dean Martin, and Sammy Davis, Jr. This time, however, the thieves are all women, lead by Debbie Ocean (Sandra Bullock), sister of the late Danny Ocean (George Clooney). Upon her release from jail after being setup by former lover, Claude Becker (Richard Armitage), Ocean immediately sets about assembling a crack team to pull off a massive jewelry heist at the annual MET gala. The plan - to lift a priceless diamond neckless off the neck of movie star Daphne Kluger (Anne Hathaway) and replace it with a fake before anyone notices what happened. 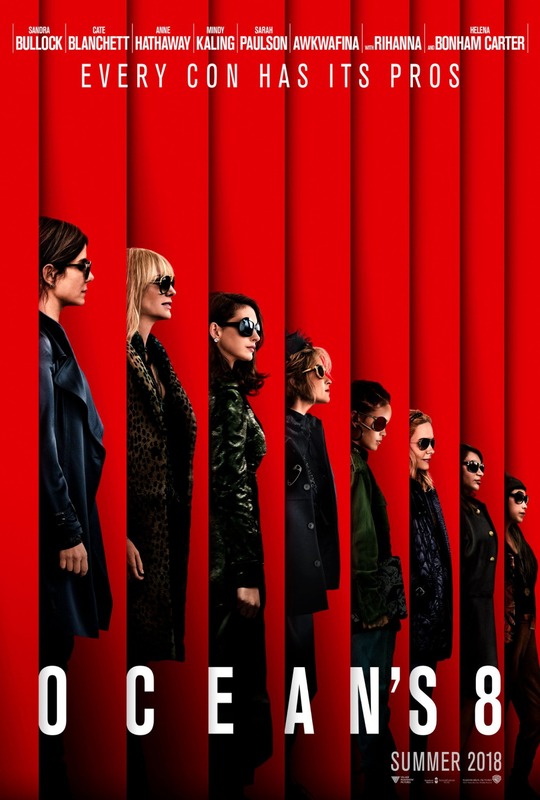 Her team consists of her best friend and master criminal, Lou (Cate Blanchett), a washed up fashion designer looking for a big break (Helena Bonham Carter), a security camera expert (Sarah Paulson), a top-notch hacker (Rihanna), a jeweler (Mindy Kaling), and a pickpocket (Awkwafina). By the end, not only will they all be wealthy beyond their wildest dreams, and have gotten revenge on the man who betrayed Ocean and locked her away. 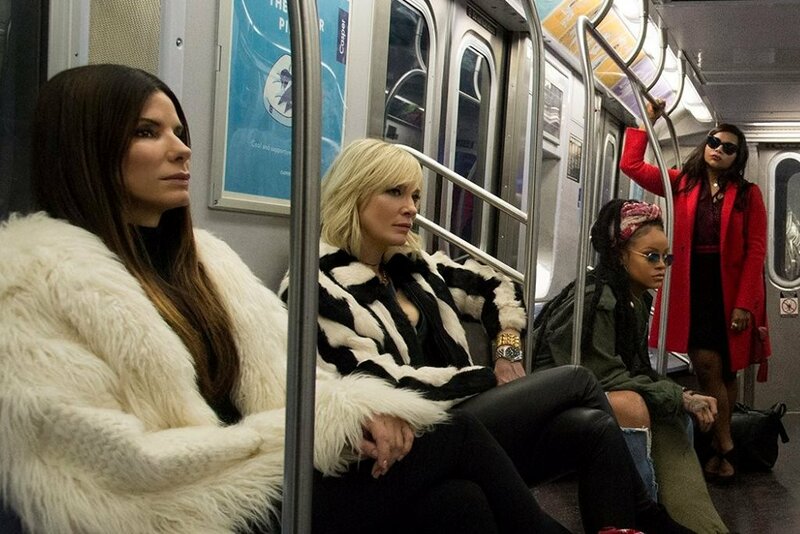 Ocean's 8 is a breezy caper filled with all the elements we've come to expect from the Ocean's films, we get to watch beautiful people make off with millions and look great doing it. It's undeniably fun, and the cast is more than game, but there is almost no conflict in the film at all. The whole thing goes off without a hitch, everything goes according to plan, the film never even hints at any kind of possible trouble. This breezy nonchalance worked for Ocean's Eleven, in part because of Soderbergh's effortless sense of style. Ross can't quite pull off that same sense of carefree charm, but he is aided by a terrific cast that pulls the film along. Like a glass of cheap champagne, Ocean's 8 is the kind of film that is enjoyable in the moment, but whose pleasures fade quickly. The cast is fun to watch (Awkwafina is a special delight all her own), but without any conflict the movie simply glides by without leaving much of an impression. In Ocean's Eleven, the heist was almost beside the point, taking a backseat to the sparkling character drama in the foreground. Here, Ross belabors the whys and wherefores but never really gives the audience a reason to care, leading to a fun, frothy, and ultimately forgettable heist movie. 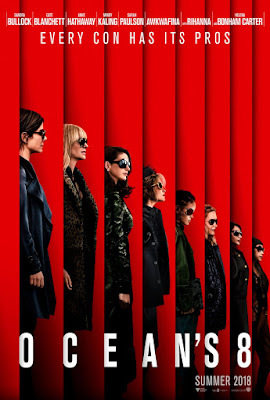 OCEAN'S 8 | Directed by Gary Ross | Stars Sandra Bullock, Cate Blanchett, Anne Hathaway, Mindy Kaling, Sarah Paulson, Awkwafina, Rihanna, Helena Bonham Carter, Richard Armitage, James Corden, Dakota Fanning, Elliott Gould | Rated PG-13 for language, drug use, and some suggestive content | Now playing in theaters nationwide.